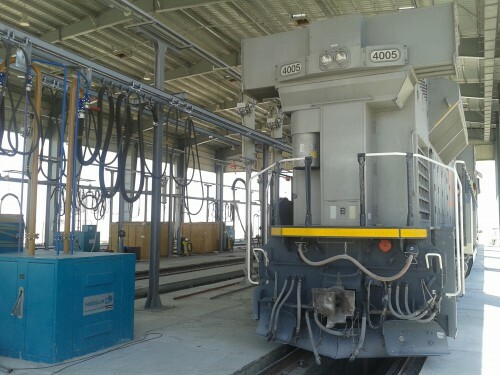 The LOCOMOTIVE FUELING SERVICE-STATIONS by Railshine enables multi product delivery, such as fuel and liquids required to refueling locomotives and other rail rolling stocks. This whole concept was experienced by many railway networks with a global approach of fuels and refueling management. The delivery is made by bespoke dispensers which deliver fuel all over the platform, adapted in flow. With its advanced software, it permits to remote visualization of all data from all sites in the network, in real time, and help you in optimizing and maintain the global fueling network. Secure system adapted to specifics of railway industry, designed to answer to all railway issues, with hoses guaranteed out-of-track. With a global system mixing GPS and gauges, we predetermine the filling time, the volumes and the maintenance of all the tanks, all the dispenser system, and all the locomotives park.